Summer is back with a vengeance. There is no relief from the scorching heat even inside, shopping being a far shot. At the same time you have run out of all your cool summer Kurtis either to repetition or the Washing Machine.Besides staying at home is simply boring, there is not much you can do with the frequent power cuts. No shopping, no electricity and no cool Kurtis; life couldn’t have been more mundane. To beat the heat without going shopping and to keep you indulged, here is a tutorial to make your own Kurti! It’s time to take out your sewing machine and upgrade your sewing skills. The tutorial may look long but it is very easy, just follow the instructions and you will end up with your own masterpiece, which you can flaunt. 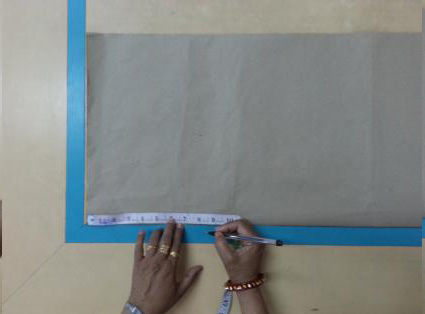 Note: The following steps are for making a medium size Kurti. 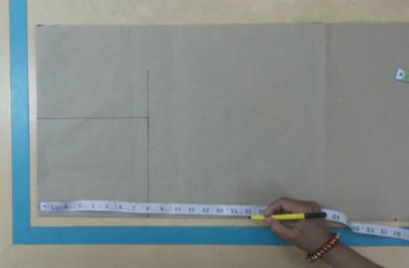 However if you want to make a kurti of different size, the actual measurements can be filled in the following box and the formulas mentioned in the steps below. Also note that Pattern making is a onetime exercise for a garment; the Kurti pattern once created can be used repeatedly. Let us begin by creating a pattern. 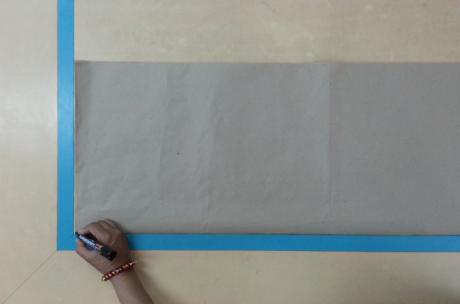 Take a sheet of brown paper and cut it into 27 x 39 inches. 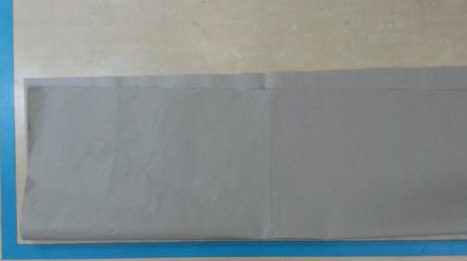 Now fold the paper into half (width side). This will leave you with a sheet size of 13.5 x 39 inches. 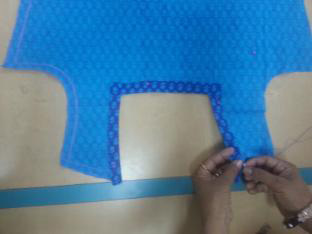 Now we will construct the various parts of the Kurti. Let’s begin with a draft for the Arm Hole and Chest Line. Let us move on and make the Chest line next. 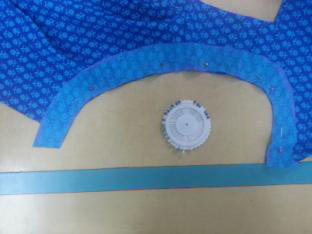 Divide your Chest measurements by ¼ and add 1.5 inches to it and make a new line as shown below. In our case this will be 10.5 inches. 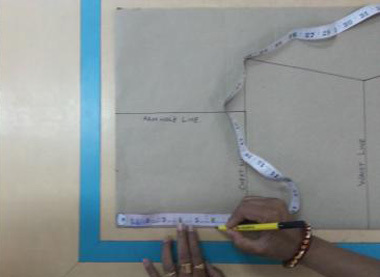 Now that you are getting pretty familiar with drafting let us tackle the length and waist lines. We will begin with the former. Make a point for the full length of the Kurti at 25 inches from the starting point. 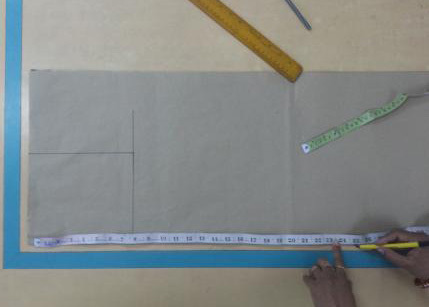 This again could vary if you are making a bigger or smaller Kurti depending on the Top Length you want. Next comes the Waist Line: Make another mark for the waist point at 15 inches from the starting point (this is the standard length for waist). Now going back to the Hip Point you had made a little earlier draw the Panel Line, which should be equal in length to the Hip Line you had marked a while back. With that last line you completed all your measurements. Now it is time to join the various lines in order to complete the final draft. In others words it is time to play connect the Dots! 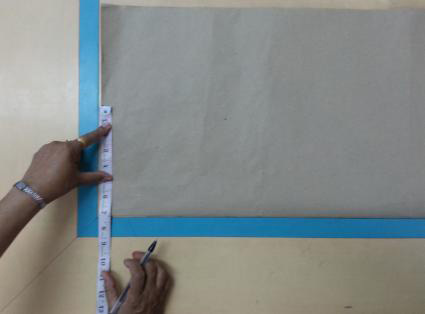 Begin by joining the end points of the Chest line and Waist line with the help of a ruler. Next join the end points of the Waist line and the Hip line using the Hip Curve Scale. 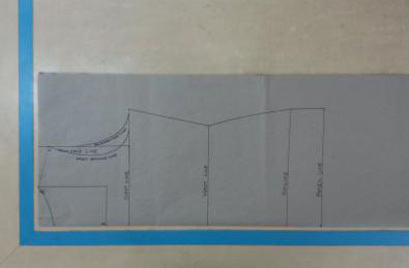 Follow by joining the end points of Hip line and Panel line with a ruler. Next it is time to work on your Kurti’s neck. 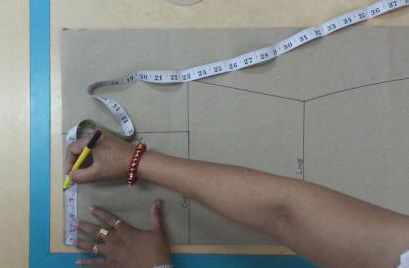 Begin with the width of the neck by calculating 1/12 of Chest measurement plus ½ inch: 3.5 inches for our medium sized Kurti. Mark the new point at a distance of 3.5 inches (or the other figure you may have arrived at through the just mentioned calculation) from the starting point and name it A. Next comes the length of the neck. Take 1/6 of the Chest Measurement (6 inches in our case) and mark point B moving horizontally from the starting point. Now join points A and B with a ruler. Next comes a tricky part. We need to make drafts for two arm holes one for the front and one for the back. We will begin with the front side. 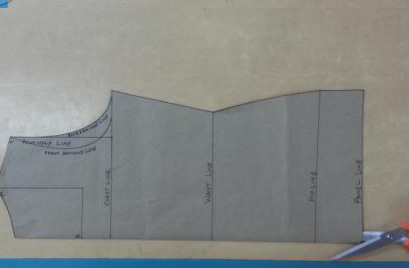 Place the French Curve as shown so that its upper end begins at Point C and lower end touches the Chest Line, draw a curve along the scale for the arm hole. Now let us make the arm hole for the back side. Place the French curve such that its upper end begins at Point C as before and its lower end joins the end point of the Chest line. Now mark a line along the Curve. You can name it back to avoid confusion with the Front line. Lastly make the draft for the backside of the neck. Make a point at 1.5 inches from the starting point. Join this point with point A using your French Curve. And you are done with drafting. Your Draft for the Kurti is ready. It should look like this. 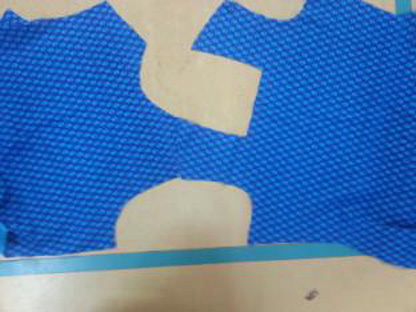 Double check if you have marked all the lines and curves before cutting out the pattern. Now cut the pattern along the outer lines. Since we require different cuts for the front and the back, cut the pattern along the fold you had made in the beginning. Next cut the front neck and front arm hole on one of the pattern. 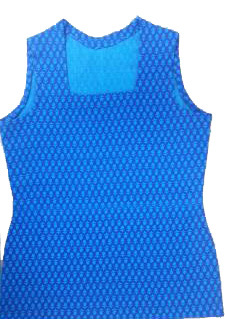 Now you are left with two different patterns for the front and backside of the Kurti. The good thing being you can always use this pattern to make all your Kurtis as long as you don’t lose or put on too much weight or for the matter grow taller! Here are your Final two patterns. Next we are left with two major steps: cutting the Kurti and later stitching it. But in order to cut the Kurti you will need to begin by preparing the fabric by marking it with the help of the draft panels, you have created. 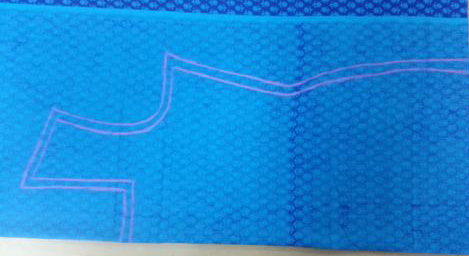 Now, mark the outline of the cut pattern over the fabric with chalk. 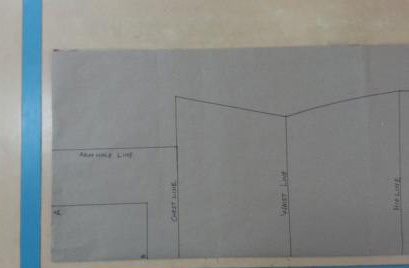 This is where the seam will be put later, it is also called the sewing line. Next draw another line ½ inch away from the sewing line. You will be later cutting the cloth along this line. Repeat the process also for the other (the back) pattern too. 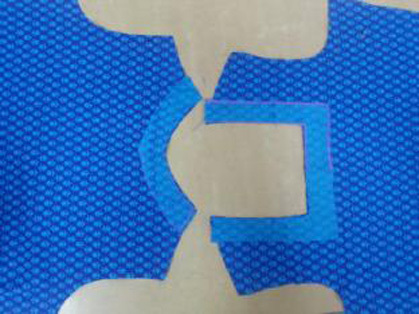 Now cut both the patterns along the outer line you had marked for cutting. 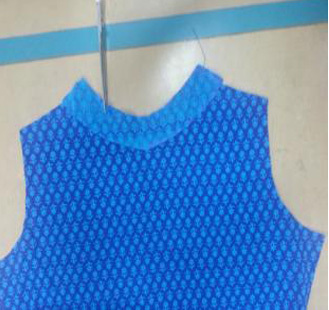 There are two parts that need to be taken care of while making a Kurti the Neck and the Arm Hole. 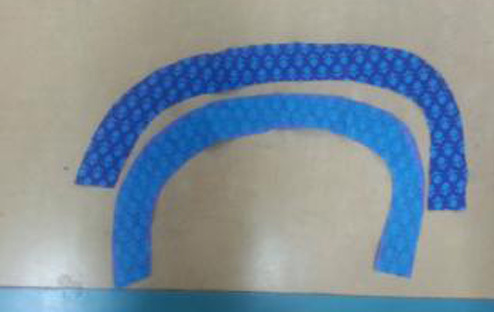 We will begin by making the Facing for the front neck. 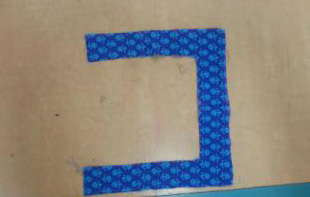 Open the folded cloth with the front pattern. And measure the length and width of the neck. We got the figures 6.5 inches for length and 6 inches for width. Next take some fresh fabric and fold it keeping the right side facing each other (the front panel and the new fabric) and mark 6.5 inches along the fold and 3 inches for width (half of the measured width). Having marked the points join them with the help of a ruler. The figures 6.5 and 3 inches are the measurements from the step prior to this one. Mark another point 1.5 inches away from the seam allowance (the just drawn line) and make a set of parallel lines. Having finished with both the front and back neck, we now move on to the Arm hole. Take a fresh piece of fabric big enough to cover the arm hole and place it flat under the front and back panel. Next make a line along the arm hole on the fresh piece of cloth. Now make another line on the fresh fabric at a length of 1.5 inches away. Cut the fabric along both the lines, and you are ready with the facing for one arm hole. Next we need to make the facing for the second arm hole. Take a fresh piece of cloth and place it below the arm facing you just made. Make sure that the right sides of the fabrics are facing each other. Mark along the outline of the facing on the new cloth. Then simply cut the second arm hole along the outlines. Now that you have the facing for the neck and arm holes, it is time for the final phase, which is stitching. 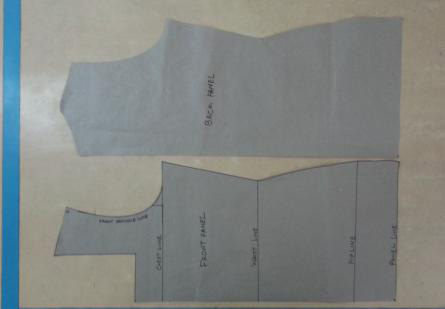 Place the neck facing for the front and back respectively over the neck cut of the main fabric panels. Make sure that the right side of the fabric is facing each other. Use sewing pins to ensure that they remain in place. 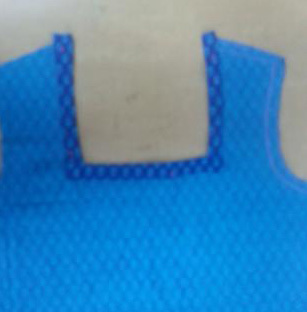 Also ensure that the edge of the facing and neckline are placed neatly together. Next place a cut at both ends of the neckline as shown below. The cut needs to remain within the stitch line. Next turn the facing along the stitch line and neatly fold it towards the wrong side of the cloth. For the Back neckline place small cuts, one inch apart along the back facing. 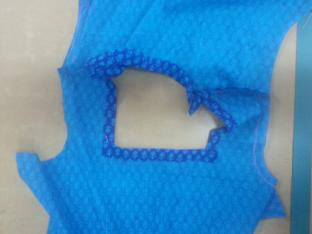 Ensure like before that the cuts remain within the stitch line. This will help you to fold the facing smoothly. 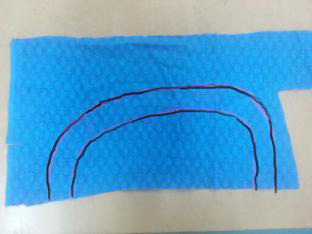 Turn the facing along the stitch line and neatly fold it towards the wrong side of the fabric. Hem the facing folded inside for the front neckline. Next match both the shoulder lines of the front and back panel and place pins to ensure that they stay in place. 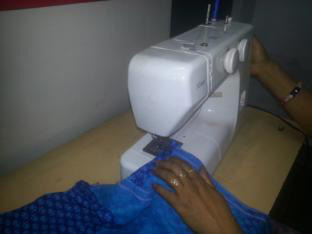 Machine Stitch the shoulder lines at distance of ½ inch away from the edge of the fabric. 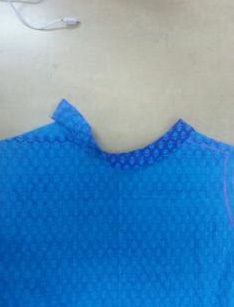 Neatly fold back neckline facing and hem it carefully to give a neat finish to the neckline. Next place the facing made for the arm hole on the kurti as shown in the picture. 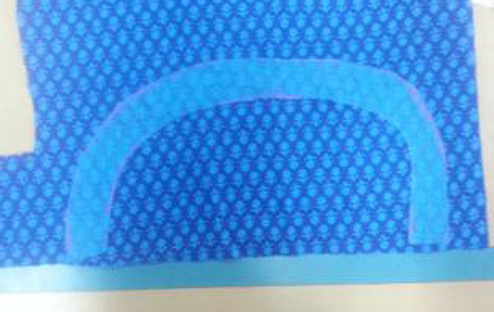 The right side of the fabrics should face each other. 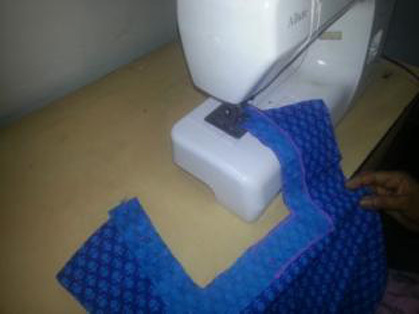 Use pins to secure the fabrics in place. 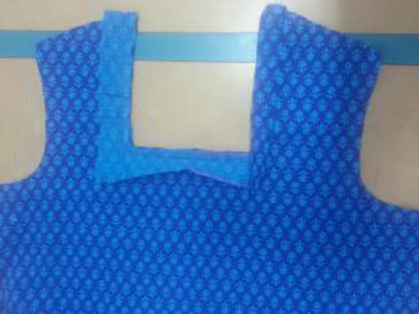 Machine stitch the facing and the kurti panel at ¼ inches away from the edge. 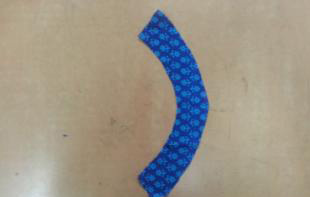 Follow it by placing small cuts on inch apart ensuring that the cuts remain within the stitched line. This again will help in folding back the facing smoothly. Turn the facing along the stitch line and neatly fold it towards the wrong side of the fabric like you had done before for the neckline. Similarly iron the arm hole facing and fold it half an inch on the wrong side of the fabric. Use pins to secure. Follow the same steps for the other arm hole. 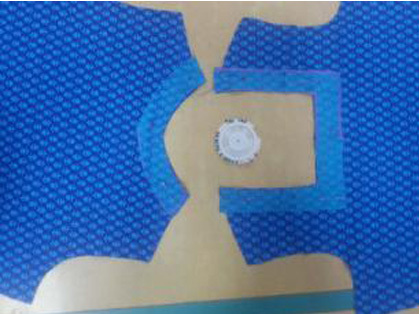 Once the facings of both the arm holes are fixed, place the kurti panels together with the right side of the fabric facing each other. 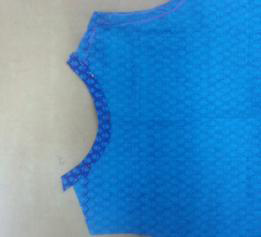 And machine stitch on both sides of the Kurti along the stitch line. Finally fold the bottom edge of the Kurti and iron. Ensure that after folding, the length of the Kurti remains at 25 inches evenly. 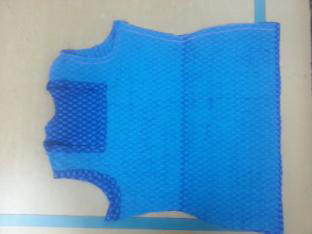 After which machine stitch the bottom fold. Ta-Da! your Kurti is ready. Time to go around town flaunting not just the beautiful Kurti but your Sewing Skills too. 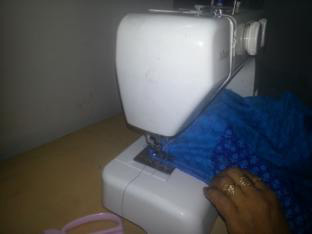 This entry was posted in Sewing and tagged Garments, Indian Garments, Sewing by Blogger. Bookmark the permalink.